Submitted by Migrate Wizard on 2014-08-11 06:00. Gameplay Length Should be relatively short gameplay. If you wanted to do EVERYTHING (there are diversions) it could take a little longer. It's just the prologue - for now. Game length depends on how long you feel like completing quests around Candlekeep. Classes Rogues will find pickable locks. Clerics and warriors are also served well with equipment and monsters to kill. This small module is a re-envisioned version of the prologue to Baldur's Gate, up to joining Imoen and traveling to the crossroads. I've eliminated from and stream-lined the quests and took some liberties with the details. I'd like to know what you think. I did not create this module with the intention of producing an improved version of a classic game. Instead, I chose Baldur's Gate as a medium for expanding my scripting skills and explore the abilities of the Neverwinter Nights Toolset. Special thanks to the original Baldur's Gate creators, the NWN Lexicon, and especially Lilac Soul's Script Generator, which is a life saver. ** Just updated with a full notebook page worth of fixes, bugs, and additions. 2/21/10. ** Final version, all bugs i could find corrected, please let me know if you find anything weird. Comment and let me know what you think. It's the right thing to do. 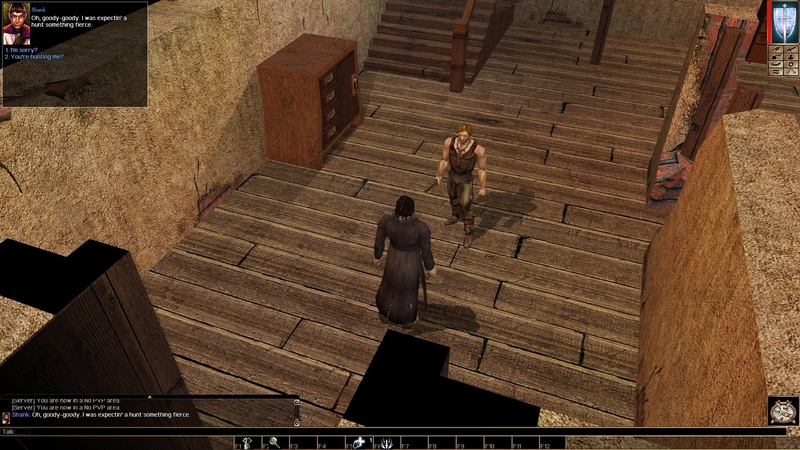 - Did the characters remind you of Old BG1, or were they a stretch? - How long did it take you to run through it? - What would you have liked to see from a BG1 remake that this doesn't have?